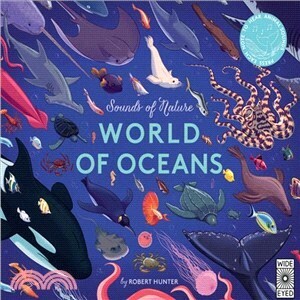 Travel the world with Wide Eyed’s Sounds of Nature series and press the note on each page to hear over 60 separate marine animal sounds, exploring ten habitats as you go. You’ll hear the squawk of penguins in the antarctic, the squeaks of dolphins in the pacific ocean, and the splash of a great white shark leaping out of the water to seize a seal. Learn fascinating facts about the animals who live in these amazing places, then use the number key to listen out for each one when you press the note. Dip your toe in, hold your breath and get ready to plunge into the deep blue oceans that cover our planet! Robert Hunter is a London based illustrator who works with traditional drawing and printing techniques to produce his otherworldly picture narratives. His clients include The New York Times, The Guardian, V&A, Picador, BBC, and Latitude Festival. His previous books include The Land of Nod (Flying Eye, 2016) and The Jungle Book (Frances Lincoln, 2016).